Day 57 – Forester here we come! We woke up at 3 am. There was a slight breeze rattling the rain fly. The light of the crescent moon illuminated the foot end of our tent. We packed our backpacks, took down the tent and were ready to go by 4 am. Right on time! The stars were amazing! Normally we are asleep before the sky gets dark enough to see the Milky Way but this morning we were up early enough to enjoy its grandeur. We didn’t know how long it would take us to get to the base of Forester Pass. 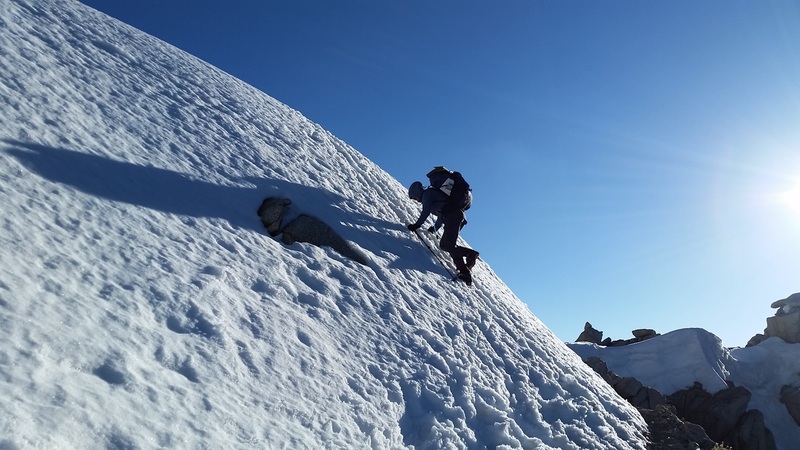 We started early to ensure we walked on stable snow on the ascent and hard enough snow to avoid post holing on the descent. 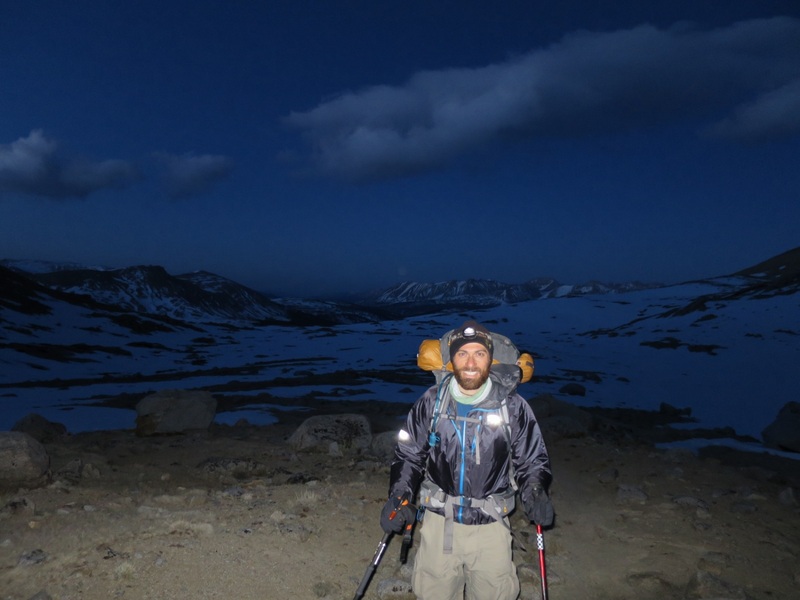 We reached the base of Forester Pass a little before 6 am with lots of breaks to take pictures, shed layers and take in the views. The snow was hard and easy to walk on. It felt like walking on hard sand. The snow crystals glistened under the light of our headlights. It was a magical morning! 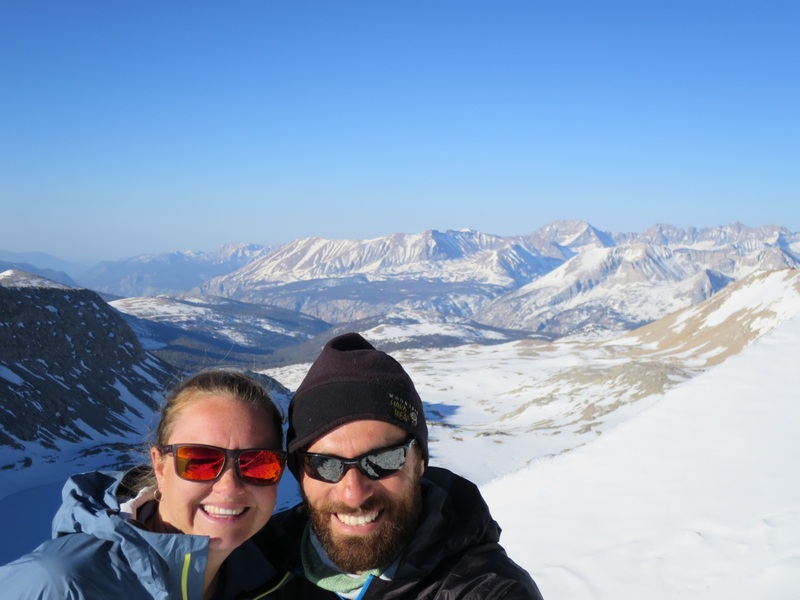 We walked past 3 sleeping hikers (2 cowboy camping and the third in a tent) and started up Forester Pass. Andy led and we followed tracks straight up. The snow was hard but sticky. We could see the switchbacks above us, heading straight up the rock wall. Right before the first visible switchback we sat down on some rocks to put on our crampons. The snow had become a little more icy and the slope more steep so the extra traction was greatly appreciated. 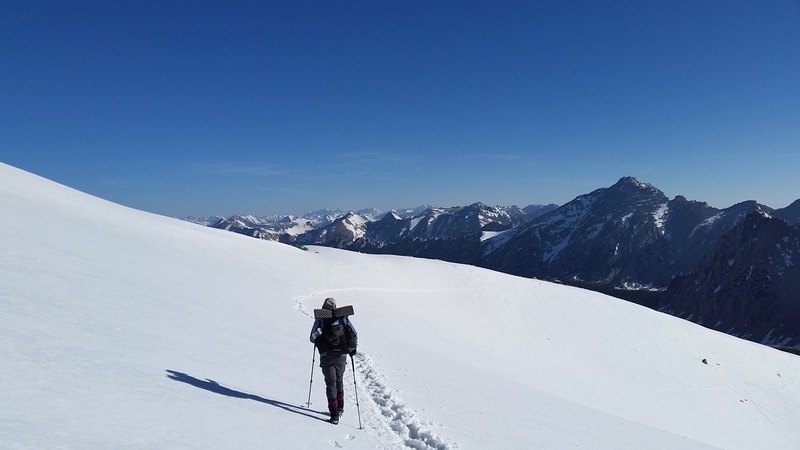 Once with crampons, Laurie took off walking sideways up the slope to meet the other footprints. She is comfortable in the snow. Andy, however, was less comfortable and had trouble making his way out of the rocks and up to the switchback. With time and encouragement he did great. 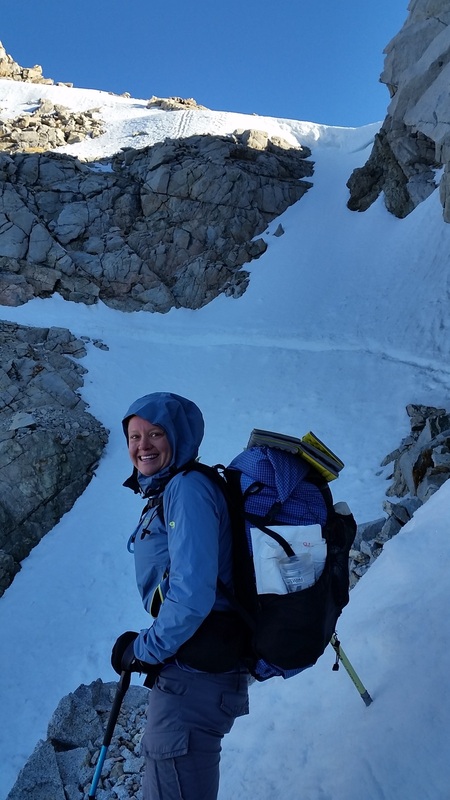 We zigzagged our way up towards the infamous Forester Pass Chute. The first 4 switch backs were snowy, before transitioning to bare rocky trail. We didn’t want to stop to take off our crampons so we chose our steps with care to minimize scraping the teeth of the crampons on rocks. After about 45 minutes we made it to the chute. This is a section of trail that is particularly exposed. Ned Tibbits, a mountain educator, comes out in early April to cut steps to help hikers safely cross the chute. Thanks to Ned and the many hikers ahead of us the chute had well defined steps. We both crossed with ease. All that worrying for nothing! (Laurie is the worry wort; Andy believed we would be fine). 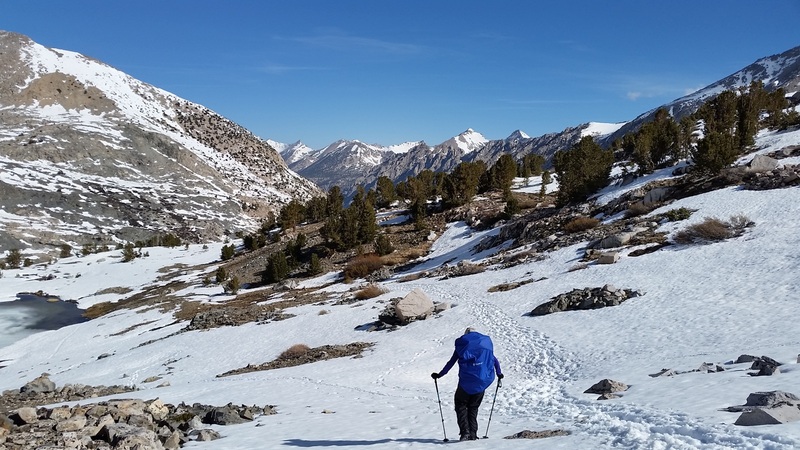 We completed another 3 switchbacks and vertically climbed the last 10 ft to the top of one of the more difficult early season passes of the Sierras. It was quite amazing to reach the Pass and peer over the snow to an expansive view of snow capped mountains and still frozen lakes. We hung out at the top for about 30 minutes, taking pictures and celebrating our success. And then we started down. Down, down, down to the valley below. Since everything was covered in snow we could choose our own path. We followed the other footsteps down the ridge, sliding down on our bottoms when we could. Other times we ran, walked and even ended up on our bottoms by accident. It was a long descent but much more fun in the still hard packed snow. We took a break on a large rock and the 3 people that were sleeping when we past them earlier this morning caught up to us. They were Sue, Reuben and Bernard! We thought we wouldn’t see them again, but the trail has a way of bringing people together. They joined us on the rock and admitted they were running out of food and were heading to Independence today. We gave them our extra food and we all headed down the trail together. We crossed many steams, swollen by melting snow; rock hopped, log walked and gingerly walked across snow bridges hoping they would not break. Around 11am, the sunlight reflecting off of the snow was intense. Laurie overheated, got quiet and grumpy. A short break in the shade helped revitalize her. We stopped for lunch near Middle Vidette Meadow with Ruben, Sue and Bernard. 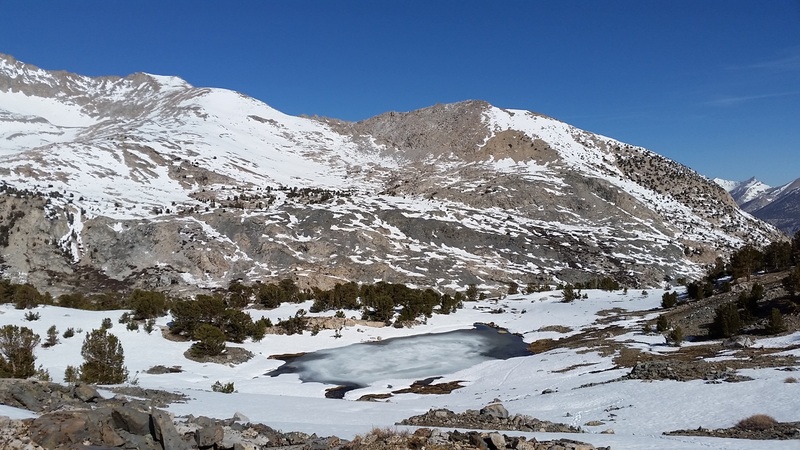 They took off 20 minutes after we arrived, motivated to make it over Kearsarge Pass and get into town. We lounged around and had a snow ball fight – started by Laurie throwing 3 snowballs at Andy and missing each time. Good thing she played soccer as a teenager! We were tired but wanted to get a little further before calling it for the day. We climbed up towards the Bullfrog Lake junction. One mile and 900 ft up. 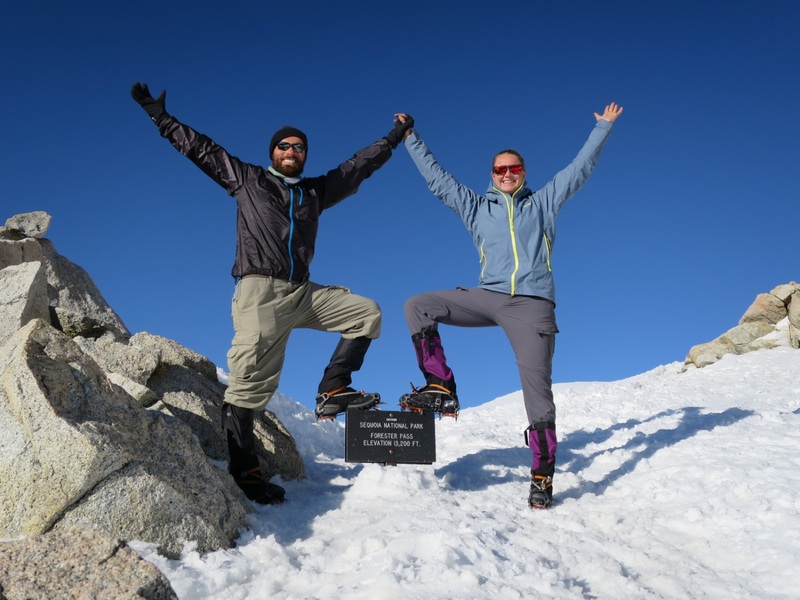 No easy task for legs that had already hiked for 11 hours on snow! We climbed up and up, stopping periodically to take pictures of the stunning views. At the junction we headed east toward Kearsarge Pass. The trail was covered in snow so it took more time to find our path. 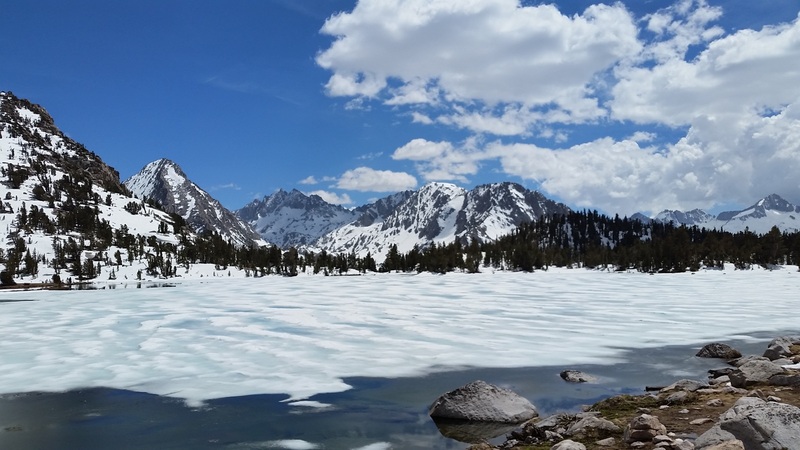 We hiked past a still frozen and quite stunning Bullfrog Lake towards Kearsarge Lakes. Once in the bowl beneath the pass we went off trail and onto snow towards one of the lakes. We looked for level spots to put our tent but couldn’t find anything not on snow. We settled for a slanted spot near the lake. Oh but what a spot this was. 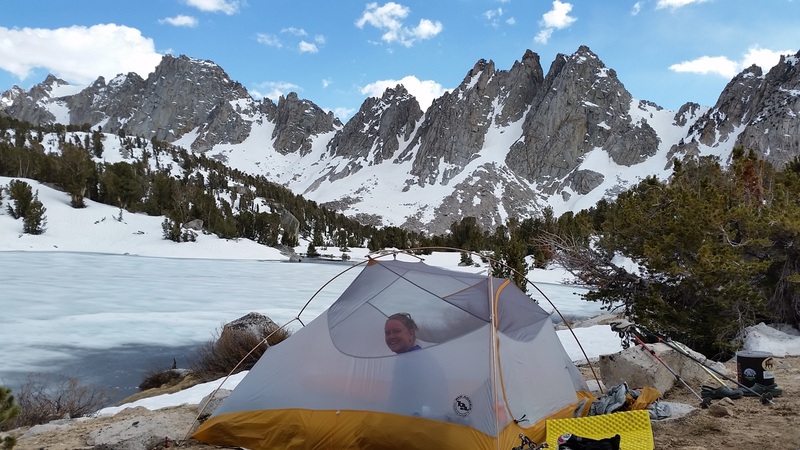 Our view of the lake and Kearsarge Pinnacles were spectacular. Tonight we chose beauty over function. We also watched hikers go up and down the switchbacks to the pass throughout the evening. Laurie was hoping that they were her friends visiting from Davis, but no such luck. We ate dinner sitting outside watching the sun kiss the mountains around us. “This might be my new favorite place in the Sierras” remarked Laurie. On this trip we get to rank them. What a treat! We’re exhausted, humbled and need to rethink our Sierra strategy. We hiked 12.5 miles in 13 hours today. No way we’re gonna make it to Mammoth in 7 days. We can accept that. It’s ok. Or at least, it’ll be ok.
Tonight we are grateful for our intuition and morning light. Oh those views! How could it possibly get old?? Awesome to read your posts, great writing & amazing pictures. Congrats on making it over Forester! Hope to see you later on the trail. Matt, it didn’t have a door handle from the outside but some hikers managed to open the door. Not sure if this was on purpose or not but we are grateful for the warmth it provided. Awesome posts, great writing and amazing pictures. Congrats on Forester! Hope to see you on the trail. Hi, forwarding to my son behind you. Several are forming a group to go through Kennedy Meadow and Sierras together. Zapatos does not want to be one of the early ones going through. Wishing Zapatos all the best through the Sierras Judy!